Pints can pop up in the funniest of places, usually your hand on a Friday night, more often than not with a pool cue resting in the other. But with its latest piece of ambient advertising Guinness had cut out the middle man – that is, you – and put the pint onto the pool cue. 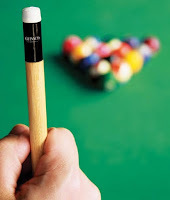 Designed by Chicago-based communications agency, Tank, the Guinness pool cue has the tip of a traditional cue replaced with a miniature version of the iconic black and white pint: the black becoming part of the neck, the white, the hair tip.